When unexpected behaviour is noticed in a program, GNU/Linux provides a wide variety of command-line tools for diagnosing problems. The use of gdb, the GNU debugger, and related tools like the lesser-known Perl debugger, will be familiar to those using IDEs to set breakpoints in their code and to examine program state as it runs. Other tools of interest are available however to observe in more detail how a program is interacting with a system and using its resources. The classic way to use gdb is as the shell for a running program compiled in C or C++, to allow you to inspect the program’s state as it proceeds towards its crash. At the (gdb) prompt, you can type run to start the program, and it may provide you with more detailed information about the causes of errors such as segmentation faults, including the source file and line number at which the problem occurred. If you’re able to compile the code with debugging symbols as above and inspect its running state like this, it makes figuring out the cause of a particular bug a lot easier. After an error terminates the program within the (gdb) shell, you can type backtrace to see what the calling function was, which can include the specific parameters passed that may have something to do with what caused the crash. Breakpoint 1 at 0x400722: file example.c, line 42. This can be useful for redirecting streams of output for a task that is taking an unexpectedly long time to run. ==29557== Copyright (C) 2002-2011, and GNU GPL'd, by Julian Seward et al. 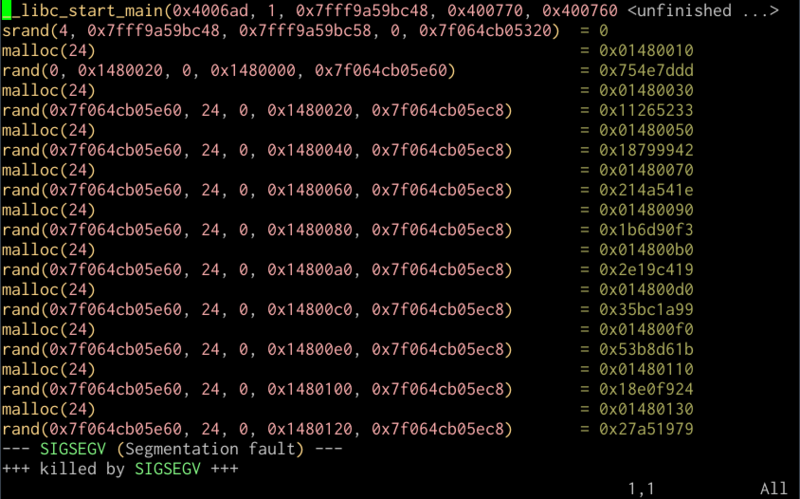 The gdb and valgrind tools can be used together for a very thorough survey of a program’s run. Zed Shaw’s Learn C the Hard Way includes a really good introduction for elementary use of valgrind with a deliberately broken program. The strace and ltrace tools are designed to allow watching system calls and library calls respectively for running programs, and logging them to the screen or, more usefully, to files. You can run ltrace and have it run the program you want to monitor in this way for you by simply providing it as the sole parameter. It will then give you a listing of all the system and library calls it makes until it exits. I’ve found ltrace very useful for debugging problems where I suspect improper linking may be at fault, or the absence of some needed resource in a chroot environment, since among its output it shows you its search for libraries at dynamic linking time and opening configuration files in /etc, and the use of devices like /dev/random or /dev/zero. This can be very useful in confusing situations with file locks, or identifying whether a process is holding open files that it needn’t. This will show you what libraries a running process is using, including those in shared memory. The total given at the bottom is a little misleading as for loaded shared libraries, the running process is not necessarily the only one using the memory; determining “actual” memory usage for a given process is a little more in-depth than it might seem with shared libraries added to the picture. This entry is part 6 of 7 in the series Unix as IDE. This entry was posted in GNU/Linux and tagged backtrace, breakpoint, debugging, file, file handle, gdb, ltrace, memory, process, strace, trace, unix by Tom Ryder. Bookmark the permalink.